• Other kite and power is different! • Can enjoy from children to adults! 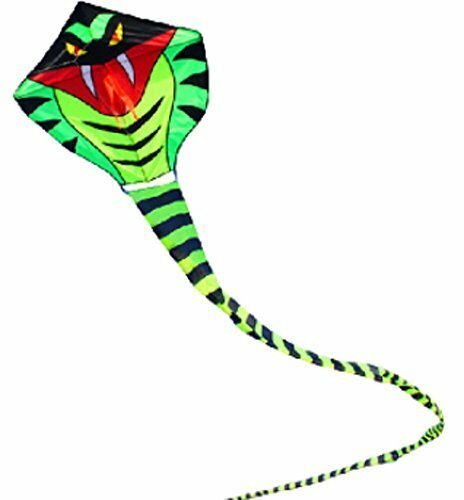 If you play in this cobra kite is always fun. • Park and the beach, camping, you can enjoy all year round, such as travel. • The two most important things you will need to successfully launch and fly your kite are plenty of open space and proper wind speed for your kite. • It's best to choose an open area free of trees, buildings, and hazardous obstacles like overhead power lines. If you're planning on flying a stunt kite, make sure any spectators know to stay behind you. • Contrary to popular belief, running is not the best way to launch a kite. In fact, it can actually make launching your kite very difficult, causing it to dive or even crash during launch. It's best to let the wind and your reel do most of the work. • If wind conditions are good, face away from the wind and hold up your kite, letting it catch the wind. As the wind lifts the kite, let line out. If the wind slows or lulls, reel in some line back in to steady your kite. Attention: In the real on the screen, it might look slightly different colors by the personal computer. The ultra-large Cobra kite full-length 30m! Who is sure to also be surprised to see! Children also is cool kite that adult also always enjoy. Recommended for Gift. Lightweight! Also easy assembly and can carry willingly because collapsible. If you have any questions about this product by SPJ-T, contact us by completing and submitting the form below. If you are looking for a specif part number, please include it with your message.